"The dealer, Semiu and Egbegbe had met briefly on December 9, 2015, at a MultiChoice outlet opened by the latter two days earlier at Uncle Joe Bus Stop at Mokola area, Ibadan. About 9 am on that day; the dealer told SaharaReporters, a man he had never met walked into the outlet requesting to buy two GOtv decoders. The prospective customer, added the dealer, said he was expecting a friend of his to bring money with which he would pay for the decoders. Shortly after his arrival, another man arrived wearing jellabiya, the long robe favored by Muslim men, and gave the prospective customer some money. The dealer, who was working when the jellabiya-wearing man handed over the cash, said he did not know the exact sum given to the first man. After handing over the cash, the man in jellabiya left. Curiously, too, the prospective customer, who would later turn out to be Egbegbe, the dealer explained, stepped out of the shop and waited outside, where he was shielded from view by a glass door. Wondering what was happening to the envisaged transaction, the dealer stepped out to check on Egbegbe. He found him standing outside and sought to know what was going on. Egbegbe, who kept impersonating a prospective customer, then pointed to a man waiting for downstairs, signaling that he was the one that would provide information required for the activation of the decoders. Though he was speaking, said the dealer, his voice was drowned out by music from the loud speakers hired to create awareness for the outlet. That was the beginning of trouble. When the jellabiya-wearing man got upstairs to meet the dealer, he announced to him that Egbegbe had taken $3,000 from him. He could not make any connection between what he heard and the transaction he was supposed to carry out. “I considered it a joke initially, but later realized that the second guy was a Hausa man, who had innocently transacted business with the pretended customer on the assumption that he owned the MultiChoice outlet,” the dealer said. The Hausa man, recalled the dealer, told him that the pretended customer had phoned him from a Fidelity Bank branch opposite the MultiChoice outlet, claiming to own that place and requesting to change naira to dollars. Apparently, Egbegbe had failed to give the forex trader the naira equivalent of the money he took from him, with currency trader lured into a false sense of security that Egbegbe owned the dealership and could always find him there. When the currency trader realized that the man he transacted business with was not the owner, he raised the alarm. “Before I knew what was happening, I was surrounded by over 20 Hausa men and dragged to Sabo, the hub of forex trading in Ibadan,” the dealer told SaharaReporters. From there, things would get nastier. At Sabo, the currency traders convinced that the dealer knew the man who took $3,000, descended on him. “I was beaten for about 45 minutes and was about to be killed before a policeman from State Investigation Bureau (SIB), named Samson, intervened and ordered us to move to Oyo State Police Command Headquarters at Eleyele,” he recalled. While relieved to have escaped jungle justice, there was to be no further let-up to his ordeal. At the SIB, the dealer and other currency traders were told to wait in a room, while the man from whom the $3,000 was taken, Samson and the SIB head went for a private discussion. After their discussion, and without any interrogation, he claimed, they were transferred to AKS for another round of beating. At AKS, he added, they kept asking him to refund the $3,000. “I kept telling them that I knew nothing about the money and that they should not kill me because of $3,000 (N750,000). After about 30 minutes of beating, I was handcuffed and taken to my office and to my house. My wife and four-year-old daughter saw me in handcuffs. They searched my house and found nothing,” he said. Before going to the dealer’s house, they had arrested the Chief Security Officer (CSO) of the Fidelity Bank branch opposite his office, where the perpetrator of the fraud claimed to have phoned the currency trader from. The CSO was arrested because the police found evidence that he had phoned. Samson, the police officer, explained the dealer, had told them at SIB that CSO called him to find out if the operation was successful and that the CSO said it was. From his house, they moved to that of his staff identified as Alfa. This is in the Agbowo area of Ibadan. They equally found nothing incriminating in the house. The dealer said he would also later discover that Samson, the policeman, told the SIB that the found firearms in his house. He was the detained for five days. While in detention, he kept requesting that he be charged to court because he suspected that there was a plot to make him face criminal charges and have him remanded in prison. On account of the suspected plot, many people, including one of his lawyers, advised the dealer to offer to pay N500,000 of the N750,000. The man from whom the money was taken agreed when it was suggested to him. He was told to put it in writing. “I knew nothing about the money and there was also no way I could raise the amount suggested, having just started business. I was given till 15 January 2016 to pay part of the money,” he narrated. While waiting outside the Anti-Robbery Squad premises on the deadline day of January 15, 2016 the dealer said he saw actress Toyin Aimakhu with a man that was being wildly cheered by policemen. He took a closer look and discovered that the man being cheered by the policemen was the person that came to his office requesting to buy GOtv decoders and eventually took $3,000 from the currency trader. On the said day the victim saw him at Anti-robbery Squad where Seun Egbegbe and Toyin Aimaku came to release Aimakhu's Range Rover that he Seun gave her which d police impounded from her driver earlier that day and fortunately Semiu saw and recognized Seun Egbegbe as someone who collected $3000 from the BDC vendor. lawyers. “I was confused. I then told one of the Anti-Robbery Squad officers that the man in front of them was the one who collected the $3,000. The officer asked if I knew the person I was pointing at. I said I was sure he was the one. The officer said he is Seun Egbegbe, a socialite,” said the dealer. Stung, the dealer I ran to the Investigative Police Officer (IPO) handling his matter to tell him of his discovery. The IPO, the dealer said, asked him repeatedly if he was sure of the man’s identity. “I told him I was sure he was the one who came to my shop,” stated the dealer. Drama then ensued when the IPO wanted to arrest Egbegbe. He was arrested after initial hesitation by police and confessed that he was the one that did it. 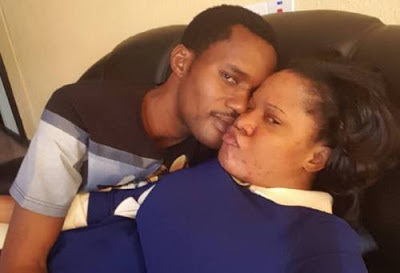 But his actress girlfriend, Toyin Aimakhu told the police that she was ready to offer them (the police) any amount to bury the case because she doesn't want a scandal, the victim wanted to press charges against Seun Egbegbe but the police colluded with Aimakhu and threatened Semiu and his co-victim with harm. Some officers were opposed to his arrest, but the IPO insisted on arresting him, and he was arrested. He confessed to the crime and promised to refund the Hausa, currency trader. The actress, added the dealer, slumped in shock. “I was invited back to AKS on January 18, 2016, for apology and compensation, but nothing not was done. The CSO and another staff of the Fidelity Bank branch lost their job. I incurred huge financial losses and almost lost my sight,” the dealer recalled.